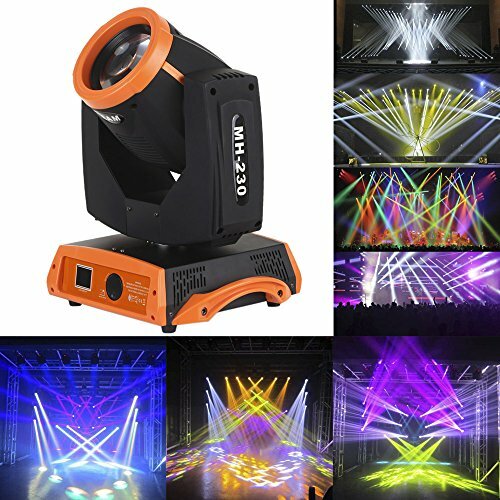 This head moving light combines beam light, gobo light and prism light 3 in 1. It has 2 build-in wheels to provides 17 gobos and 14 colors and 1 prism with 8 facets to create prism effect. Supporting strobe and dimming function, the light will effectively raise atmosphere. What are you waiting for? Choose this light, choose your unique stage. The minimum distance between inflammable object and the stage light must exceed 12m / 19.4ft. BUILD-IN DOUBLE WHEEL: 1 gobo wheel provides 17 gobos, 1 color wheel provides 14 colors. HEAD MOVING: 540 degree free rotating on pan, 270 degree rotating on tilt. BEAM: RGBW light in 20m / 65ft beam. GOBO PATTERN: 17 gobo patterns to decorate stage. PRISM: Prism with 8 facets creates more light effects.